These certainly are a valuable addition to any painters outdoor kit. Eliminating the need for cumbersome and fiddly pots of water whilst working out of studio. They provide convenience and ease; only requiring a slight squeeze of the handle to express water from the bristles. Cleaning the brushes is just as easy – squeezing the reservoir and wiping the brush head with a tissue. The brand I currently use is by Kuretake. They are available in Fine, Medium, Large and Broad heads and being fairly cheap it’s useful to have all four types. 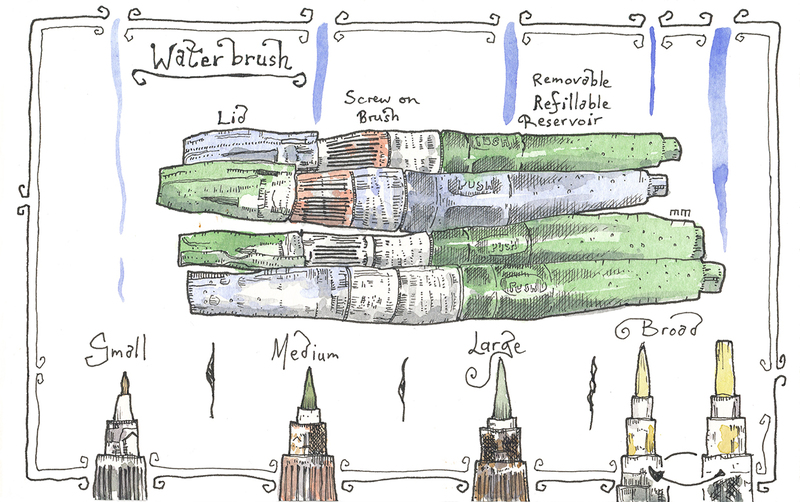 One thing that I find particularly useful is that, carrying all four water brushes means that should you empty one water brush reservoir it’s fairly strait forward to swap reservoirs with one of the others. This is the second part of my review of my Sketchkit materials. Read about my Pens here. After much trial and error I discovered Uni Pin fine liner pens. These are produced by Mitsubishi. These are the ones that I use the most. 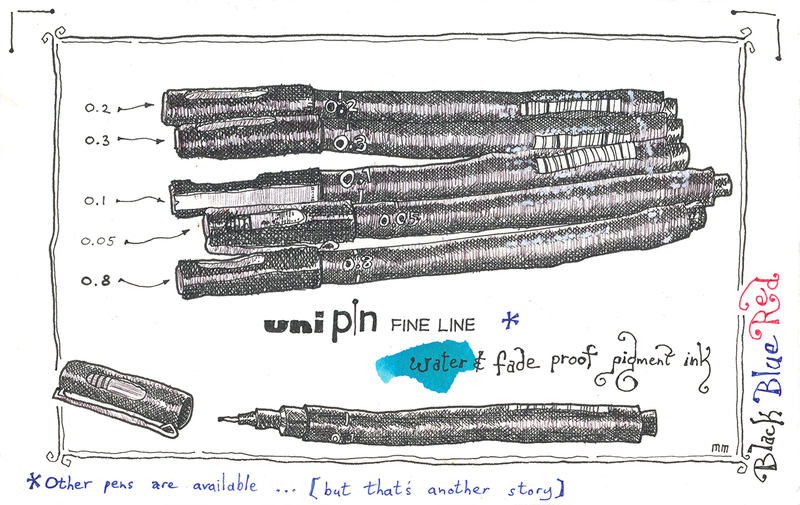 I do use other pens for more specific tasks, But Uni Pin are the ones I prefer for both studio work and urban sketching. I tend to favour 0.05 0.1 0.2 0.3 0.8 But 0.4 and 0.5 are also available. As well as all 7 nib sizes being available in Black, Red and Blue. Lines are consistent. And there are no problems with ink flow. The ink dries very quickly on contact with a suitable surface, which needs to be porous, but not on waxed or plasticised surfaces. The pens work well on the paper of both the Moleskine watercolour and sketch books. I would say that the lifespan of the pens is fairly lengthy; allowing for pretty much heavy use over about three weeks. But, of course this will vary with the amount of pen work that you do. As the pen nears it’s, fairly lengthy, lifespan, and the ink begins to run out, lines and ink flow become less defined and the pens can be used for lighter shading work. At the moment I tend to use specific sizes of pen for specific jobs. 0.05 – For additional hatching and shading; usually over the top of water colouring. This post is part of a longer series about the materials that I use.